The most extreme tour of the year has returned with its most devastating and anticipated line-up yet. 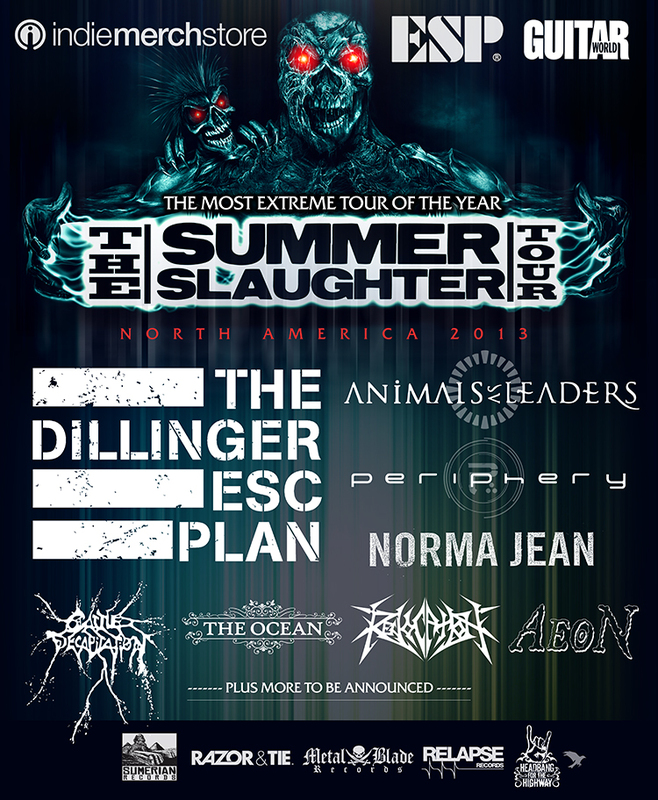 The 7th annual Summer Slaughter Tour, presented by Indie Merch Store, ESP and Guitar World, is now officially slated to run from July 19th through August 24th. It features such heavyweights as THE DILLINGER ESCAPE PLAN, ANIMALS AS LEADERS, PERIPHERY, NORMA JEAN, CATTLE DECAPITATION, THE OCEAN, REVOCATION, AEON and two bands TBA. Stay tuned over the coming weeks for official tourdates to be announced. Ash Avildsen, founder of Summer Slaughter on this year's edition of the tour: "It's year seven and I think 2013's line-up is the most exciting and diverse yet. Slaughter has never been a one dimensional experience for fans. This year is a true testament to that as we have an amazing mix of extreme music's influential icons and leaders of the new school. Let the underground unite!" Greg Puciato (DEP vocalist) states: "We can't wait to get back on the road! We're launching a US tour in the spring, hitting Europe for some festivals and club shows, and then hitting several more cities with Summer Slaughter all summer long. We are absolutely amped. After being holed up in the studio for such a long time giving birth to One of Us is the Killer, we are all pent up and ready to share material new and old with our supporters doing what we love to do the most. Can't wait to see and either kiss or rip off each and every one of your faces on the road with Summer Slaughter and year round, everywhere." Be sure to visit www.facebook.com/summerslaughtertour for all up-to-date news and ticketing information.